Gary Bauer, Contributing Author: Public support for Obamacare has fallen to its lowest level in years, according to a new Kaiser Health poll. Just 35% of Americans approve of the law. Unbelievably, 42% of Americans did not know that Obamacare was on the books as the law of the land. Seven percent thought the Supreme Court struck it down, and 12% of Americans thought Congress had repealed it! It's no surprise that support for Obamacare has tanked. It is hurting economic growth. Moody's economist Mark Zandi said today, "Nearly every industry has seen slower growth since the beginning of the year. Smaller businesses are experiencing much weaker growth." Why might that be? Zandi added, "The data seems to be suggesting healthcare is having an impact." It's beyond "suggesting." As we have often documented, major companies have explicitly stated that they are cutting back on hours and investment because of Obamacare. And the worst is yet to come. As this column suggests, tens of millions of Americans have yet to experience the coming price shock that will accompany Obamacare's formal rollout. 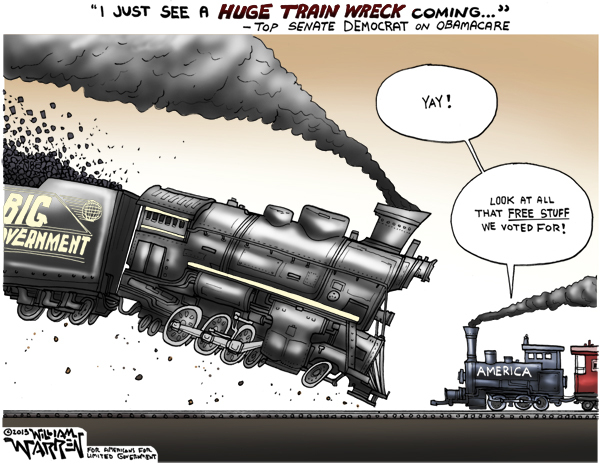 Even liberal Democrats are calling it "beyond comprehension" and warning of a "train wreck." Tags: Gary Bauer, Campaign for Working Families, Obamacare, On Life Support, Train Wreck To share or post to your site, click on "Post Link". Please mention / link to the ARRA News Service. Thanks! One can hope that the complexity and confusion will cause the whole thing to collapse upon itself.